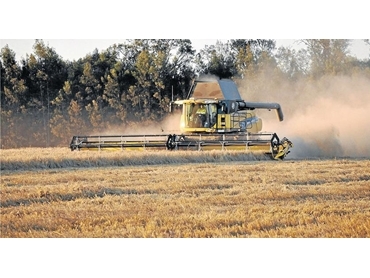 CR9000 twin rotor combine harvesters from New Holland are designed for professional harvesting operations with proven field performance. Available in a range of five models across narrow frame and wide frame options, the twin rotor combines fulfil high expectations for throughput capacity, machine sophistication and ease of operation. All New Holland grain harvesters are powered by the FPT Cursor series engines with a proven track record of reliability, longevity and longer service intervals to ensure long hours of operation during the critical harvesting periods. Narrow frame rotary combines have a class leading cleaning area of 5.4 m² while the wide frame models lead with a cleaning area of 6.5 m². These large cleaning areas ensure high quality clean grain all the time. Narrow frame combine harvesters have a grain tank capacity of 11,100 litres while the wide frame CR9070/80 models have a capacity of 12,333 litres ensuring long periods between unloading. The wide frame CR9090 has a grain tank capacity of 12,500 litres. Unloading rates of 113 litres/second will empty the grain tank quickly.